Joomla 2.5 has just been released, and it finally supports databases other than MySQL! You can now use Microsoft SQL Server (including the express versions) with Joomla. Many web developers will probably be using MS SQL Server Express for developing sites on their local machine. 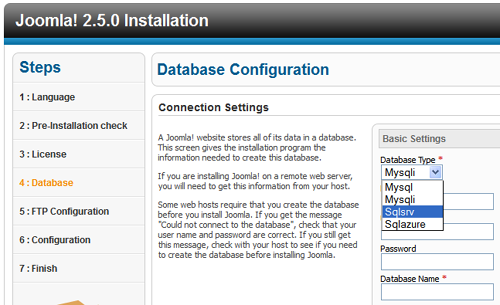 The following steps show you how to setup and install Joomla 2.5 with MSSQL. The Microsoft Drivers for PHP for SQL Server driver is needed to connect to SQL Server with PHP. These drivers also provide support for PDO. When you run the setup program, a good place to install the DLLs are in the ext folder in the PHP installation (i.e. C:\Program Files\PHP\ext). The first line is all you need, unless you use PDO which the second line adds support for. Copy Joomla to a folder where you web site will host it and setup IIS to point to it. You still need to manually create a database with SQL Server Management Studio. Once this is done, run the Joomla installation program. Follow the normal installation routine until you reach the Database Configuration page. When you select the Database Type, you will have the option of Sqlsrv for MSSQL on your server, or Sqlazure for SQL Azure for cloud-based Joomla (see image below). After these are setup correctly, the rest of the Joomla installation proceeds normally.